Nagpur-headquartered Community Development Society (CDS) works towards poverty alleviation and holistic development of the needy in the urban slums of Nagpur and the villages of Maharashtra. CDS started providing micro-credit loans to women and poor entrepreneurs nearly 30 years ago. The loan amount is capped at Rs15,000 for a single borrower and the minimum interest rate charged is 24% for a tenure of 10 months. The processing fees range between 4% and 6%. CDS also runs Balwadis in villages for poor children and conducts health camps in neighbouring villages. Sector & Positioning: CDS pioneered the concept of offering micro-credit loans to the needy for setting up entrepreneurial ventures in Nagpur. CDS is a member with All India Association for Micro Enterprise Development (AIAMED), an association formed to build capacities of microfinance institutions. It is the only Chartered Member from India of Opportunity International Network Council (OINC), a global network to alleviate poverty. CDS is the only NGO in Nagpur known for having played an instrumental role in the formation of 600 SHGs consisting of women participants only. Impact & Outcome: Since inception, CDS has disbursed micro-credit loans to over 200,000 individual borrowers. Of this, nearly 85% were women borrowers. Between FY11 and FY14, CDS granted micro-credit loans to 5,200 individual borrowers from 5,500 applications received (95% acceptance rate). Today, nearly 75% of CDS borrowers, who set up new ventures, continue to run their business successfully and are known to be financially stable. In fact, some of their women entrepreneurs/borrowers have been recognised by Citibank which honoured them with the National and Entrepreneurship Development Award. Today, these entrepreneurs also volunteer with CDS. Financial Performance: CDS belongs to the cluster of NGOs which are less vulnerable to the risk of seeking funds from external sources. 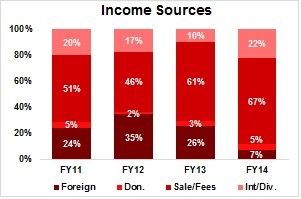 CDS has a diversified range of own income sources with an average of 56% (FY11-FY14) of total income earned from own sources like loan interest, processing charges, and rental income. For the same period, 17% was earned through interest on deposits. The YoY decline in contribution from OINC (foreign funder) in past 3 years dragged the top line of CDS, which fell by 16% YoY and 13% YoY for FY13 and FY14 respectively. Self-Sufficiency Ratio (SSR) which measures the percentage of own income v/s external income stood at 52% in FY14; the highest among its peers. 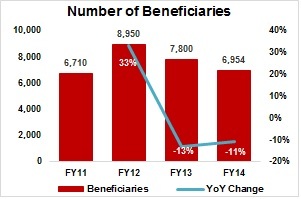 Despite weak YoY growth in income, CDS’s spend on beneficiaries has been inching up YoY since FY11. 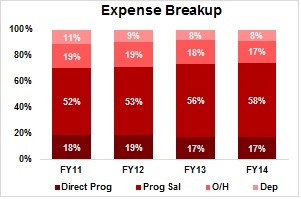 It spent 75% of its expenses on beneficiaries in FY14, the highest since FY11; but lower than spend on beneficiaries recorded by peer NGOs at ~85%. CDS has the largest trust corpus of Rs12mn v/s its peer NGOs. During FY14, it had written-off bad debts worth Rs5mn; eroding the balance sheet size from Rs32mn in FY13 to Rs27mn in FY14. Corporate Governance & Reporting Standards: CDS is a well-governed, professionally-run organisation under the stewardship of founding member and President Rev. Mr. P. Y. Singh. CDS has a strong and an active Board of Trustees and Governing Body. Annual Attrition rate is less than 10%; suggesting a healthy work culture. Reporting standards maintained by CDS are of the highest order and most of the data is available in the public domain. Financials are made available on request. Major Challenges: Expansion to other locations (at present spread over 9 locations in Maharashtra) due to availability of limited funds is the biggest challenge faced by CDS. The organisation is looking for volunteers who could help CDS become even more visible and build their brand using social media.